Hope you are having a fabulous week. This is the second holiday outfit I am posting. Did you read about my other post – Pastels and Sparkles. It’s been raining donkeys and dinosaurs in the bay area lately. So I took these pics while it was drizzling lightly. I love these pics with the fall leaves all around and the light. 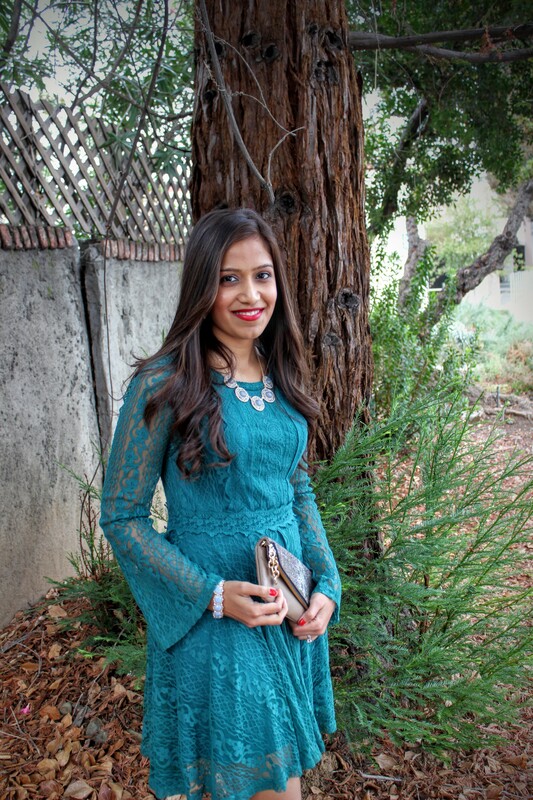 I have styled a green lace bell sleeved top with some sparkly jewellery and heels. 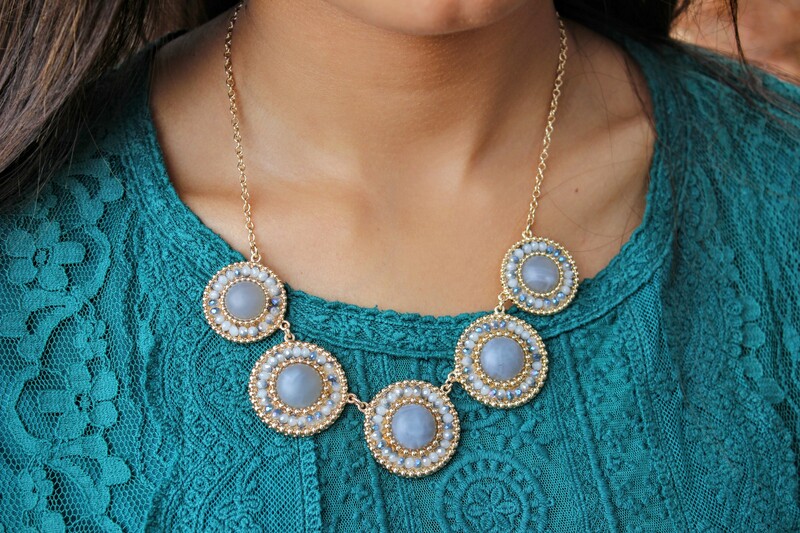 You can definitely style something like this for the holidays. It’s sophisticated and sweet look which would gain approval from family and friends ;). 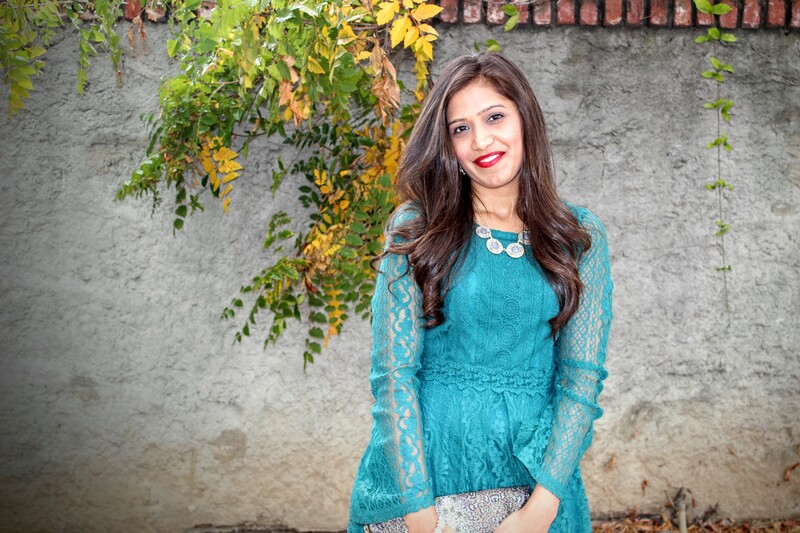 Style Tip 1: Match lip colors with your outfit – Say with me – Green and Red, Blue and Pink. For some reason, I’ve noticed red lips looking great with a green dress and pink lips with blue. I think the color combinations compliment each other very well. 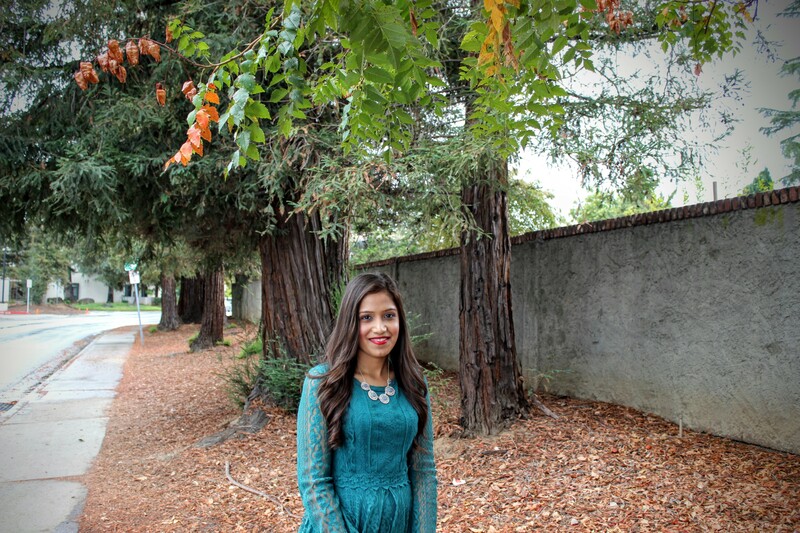 Also, bell sleeved dresses are a great idea for the winters. You can wear them with stockings and they cover you up and look very stylish. Style Tip 2: Pastel accessories with a dark colored dress – This year try and mix pastels with a dark shade, you never know it might end up looking stellar and it will never overpower your outfit. The light blue earrings, necklace and bracelet that I am wearing in these pictures are all from Francesca’s Collections. I love how elegant they look. Since these are pastel shades, they don’t dominate the outfit you are wearing. So they are perfect for those classy dinners. Hope you had fun reading. Let me know if you have any questions in the comments section. 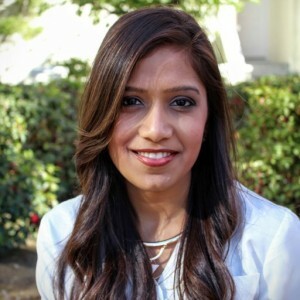 I love the dress girl n styling tips… Which lip color r u wearing??? 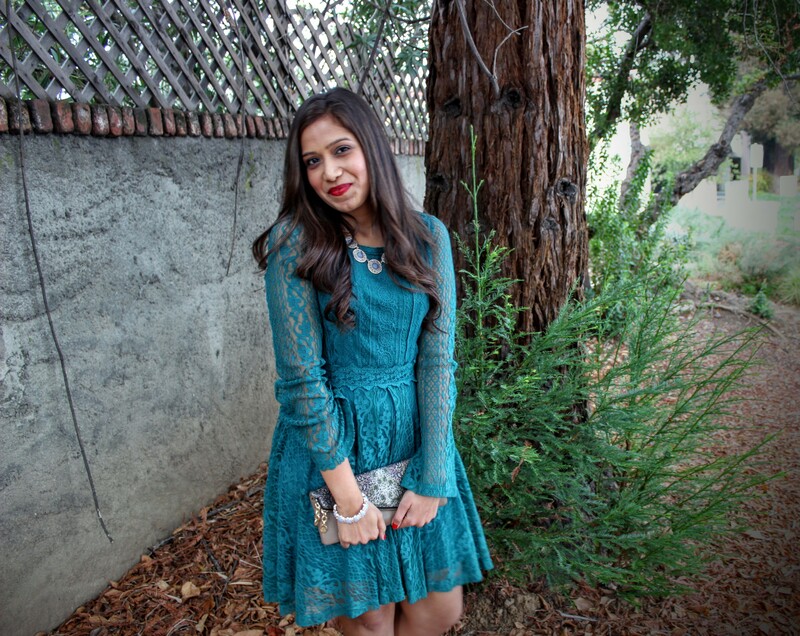 Great style tips and darling dress on you! Pairing this dress with neutral accessories was a great choice! You look so beautiful in that dress! I love the deep green! Very pretty! Have a wonderful week ahead! 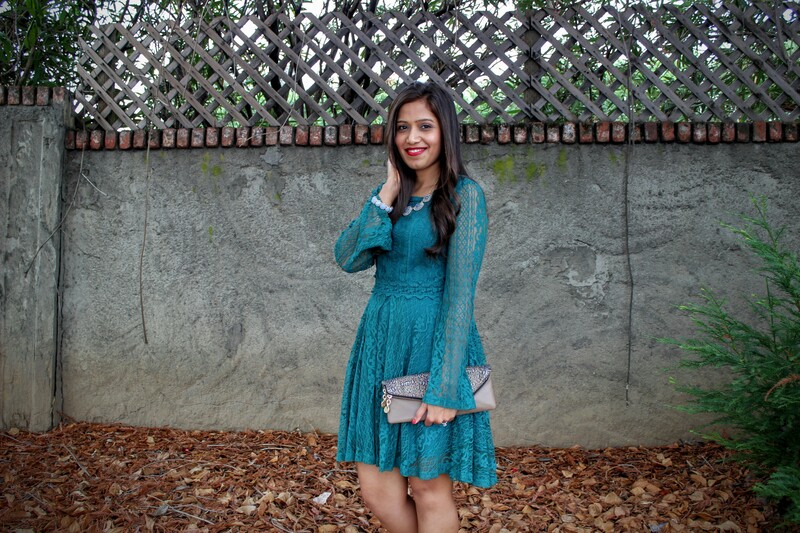 Beautiful green lace dress Ankita! It looks great on you!